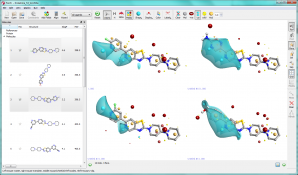 TorchLite is a molecular editor and viewer that displays molecules in 2D or 3D with their associated field patterns and physicochemical properties. TorchLite can be used to analyze activity, toxicity and ADME properties and correlate them with molecular fields. Histamine plays a variety of physiological roles in the CNS and peripheral tissues through the four known G protein-coupled receptors, H1, H2, H3, and H41. Histamine H3 receptor antagonist-enhanced neurotransmitter release offers a promising approach to the treatment of several CNS disorders2. Data on several H3 antagonists were extracted from ChEMBL3 and analyzed with TorchLite. Each member of the chemical series was drawn in TorchLite and molecular fields added. The field point patterns were studied to delineate the root causes of biological activity. Higher activity was associated with negative field patterns in the lower left of the presented molecule views, and was probably due to specific hydrogen bonding interactions. However, the highest actives also presented high electron density in both the terminal and central 6,5 aromatic ring systems, as evidenced by larger negative molecular surfaces shown below. Rao AU, Palani A, Chen X, Huang Y, Aslanian RG, West RE Jr, Williams SM, Wu RL, Hwa J, Sondey C, Lachowicz J. “Synthesis and structure-activity relationships of 2-(1,4′-bipiperidin-1′-yl) thiazolopyridine as H3 receptor antagonists.” Bioorg. Med. Chem. Lett. 2009 Nov 1;19(21):6176-80. Epub 2009 Sep 6. M. Berlin and C. Boyce, “Recent advances in the development of histamine H3 antagonists”, Expert Opin. Ther. Patents (2007) 17(6), 675. Available from EBI at https://www.ebi.ac.uk/chembldb/.